For those who missed the last bike marking sessions and want to get their bike marked (to frustrate bicycle thieves) there is another one on today outside the police office in Central Road. 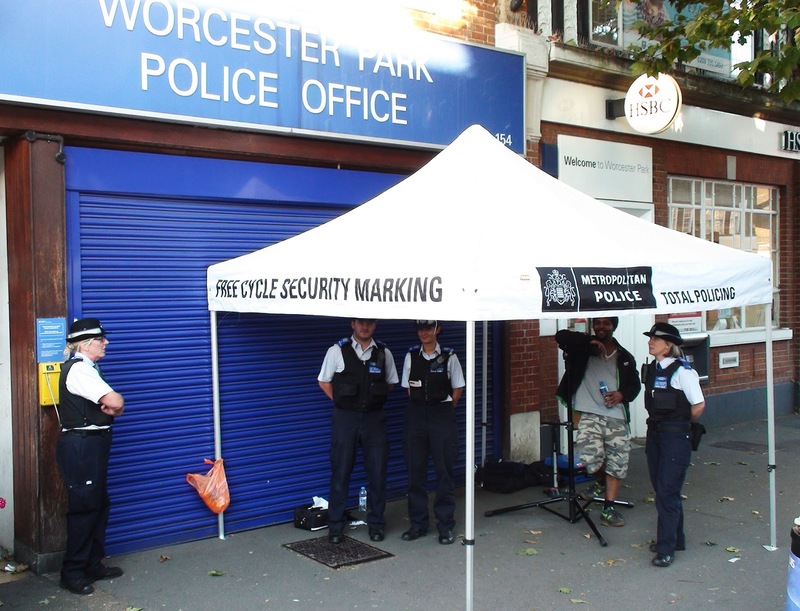 They will be there from 3pm 'til 6pm and bike marking if offered for free. It means that if your bike is stolen it can a) Be proven it was stolen, and b) Be returned to you. So it make sense both in terms of making it less attractive to thieves and more likely to be returned to you if stolen. "I cycle to work on a regular basis in tooting. I am a sedate middle ages woman and I don't (luckily for you guys) wear any lycra. The closer to WP I get the more thoughtless and aggressive the car drivers get with vans and cars regularly passing me so closely, on both sides of the road, that i feel very threatened. I have read on line and experienced the aggression that some car drivers feel towards cyclists, but, I think we need a big re think about it. Our traffic is almost at a stand still at certain times of day and generally we can no longer take petroleum based transport for granted. Sutton has one of the lowest cycle journeys out of any London borough and this [cycle journey rates] is no surprise to me. My children never cycle and nor would I let them when some car drivers behave so thoughtlessly towards cyclists - but at their age almost all of my journeys were by bike as was the same for all my friends. The more people that choose to cycle in our borough the more free the roads will be for motorists and the better the environment will be for our children." In my previous job I used to cycle every day to Surbiton station (where I caught the west bound train - with my bike - to work). This meant riding down part of Central Road and along Malden Road, quite quickly and usually past stationary traffic in the mornings. Personally I was probably quite lucky as I rarely had any worrying incidents to report. But I have certainly been in some near misses on my bike and was once actually hit by a car turning in front of me which brought me off my bike but luckily only resulted in a few scrapes and bruises. Conversely, when I drive I find it extremely frustrating when a small minority of cyclists feel it is their right to not take into account cars that may need to get past them or even deliberately (or perhaps just thoughtlessly) get in the way of cars. So whilst I would echo Jane's calls to keep an eye out for cyclists (and in doing so making cycling safer and more attractive), it goes both ways and I would ask all road users to look out for and respect all other road uses - no mater what form of road use that takes.